Challenges: Even spread of lighting needed, low glare essential , comfortable bright white light needed, maintenance is expensive and a headache, long running hours are expensive! Light Kinetics address ALL of these key challenges comprehensively. Good under-canopy lighting provides high vertical light levels and natural color rendering to ensure visitors can easily see information and not be blinded by glare. 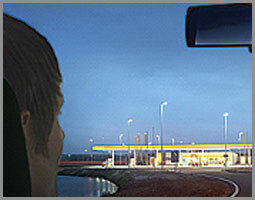 Upgrade petrol stations into branded landmarks with a safe, welcoming atmosphere. Light Kinetics Led Lighting solutions ensure a perfect balance between area, under-canopy and shop/store lighting, making visitors feel comfortable and leading them to information you want them to see and products to sell to.